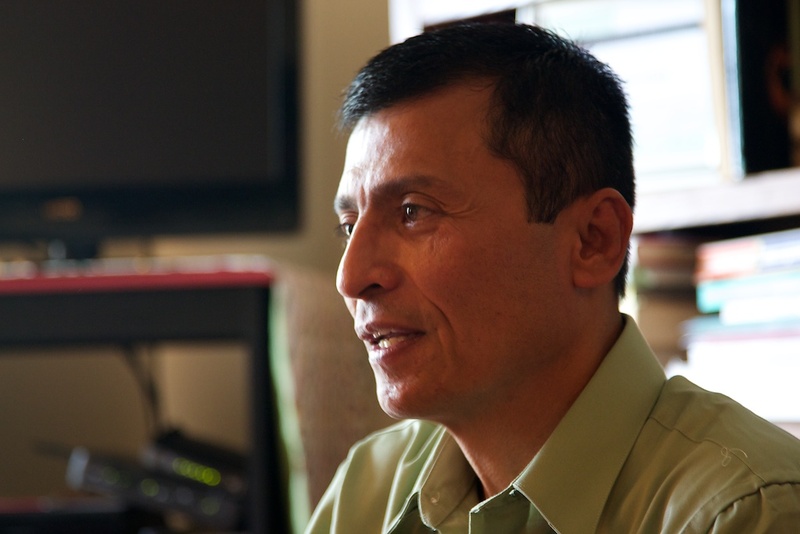 A documentary exhibition about the refugees and immigrants now living in northern Indiana. Earlier this year, I created a 10-minute video introduction to my documentary, Yearning to Breathe Free, that was meant to serve as an overview to the influx of Burmese refugees into northern Indiana. Some of you have been kind to watch the rough cut of it for me to provide your valuable feedback. A couple of you have translated the voiceover so that we could add Burmese subtitles onscreen. Thank you all. I have waited many months for a reply from a musician and his recording company about whether I would be given permission to use his song to which I had edited and timed the video. It’s a very appropriate and compelling song, and I felt quite confident that, given the worthy non-commercial cause of helping refugees assimilate, I would be given permission. On Friday I learned that my request has been flat out denied. Although very disappointed to be thrown back to square one in this endeavor, I am grateful for the expert services of MeitusGelbertRose law firm in Indianapolis who volunteered to pursue the music rights. Such service to the film industry is the firm’s specialty and they couldn’t have been more helpful. Unfortunately, “yeses” aren’t always received from musicians. Therefore, for those of you hoping to use my overview piece in the near future for speaker bureaus and events to increase awareness of our refugees, I’m sorry that my video won’t be available to you to use. Please stay tuned for whatever the next chapter becomes in this on-going endeavor. 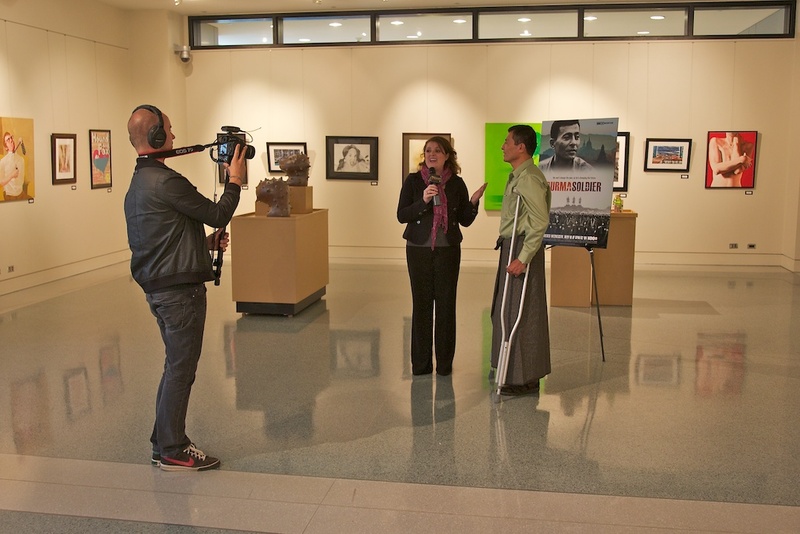 I hope for a documentary exhibition in Fort Wayne during the fall of 2012. Myo Myint. © 2011 John Gevers. After much anticipation, the new documentary about Myo Myint’s life debuts on HBO2 this Wednesday, May 18, at 8:00 pm EST. 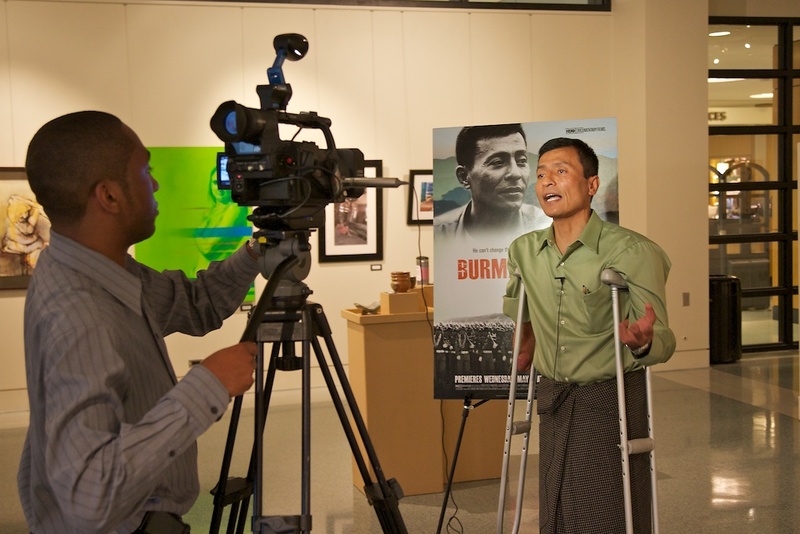 The compelling documentary chronicles this Burmese man’s journey from being a soldier to incurring life-changing injuries on the war front to rethinking his position on Burma’s civil war to demonstrating for change in his country’s one-party rule system to being arrested, tortured, and imprisoned for a total of 15 years to fleeing for a refugee camp, to reuniting with other family by resettling in Fort Wayne, Indiana, as a political refugee. And he continues his fight for civil rights and freedom in his nativeland from his new homeland. This important new HBO documentary is A LeBrocquy Fraser/Break Thru Films Production. It is directed by Nic Dunlop, Annie Sundberg, and Ricki Stern; written by Annie Sundberg and Nic Dunlop; and produced by Julie LeBrocquy. 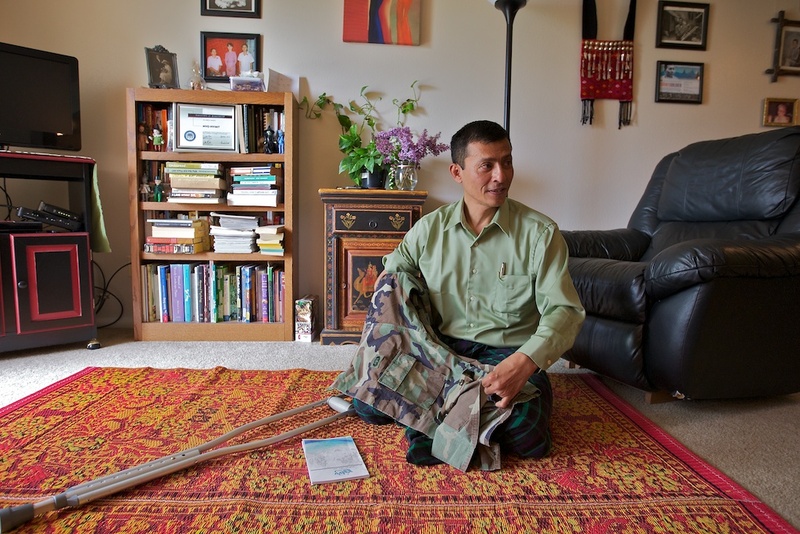 Myo Myint and army jacket. © 2011 John Gevers. 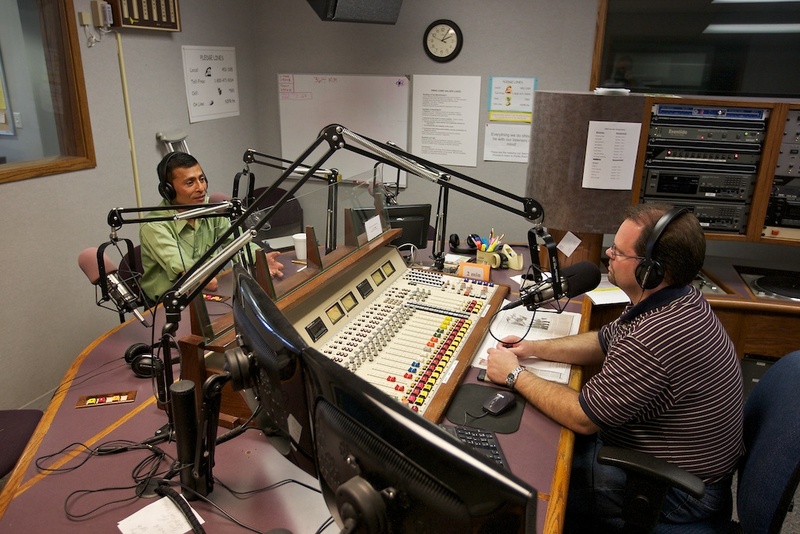 Many thanks to local journalists Mike Summers, Ellie Bogue, Phil Shaull, Emilie Henry, Kim Meiser, John Hartman, Adam Widener, John Davis, and Bonnie Blackburn (in order of stories appearing) for providing such good local coverage. That’s “thank you” in Burmese. 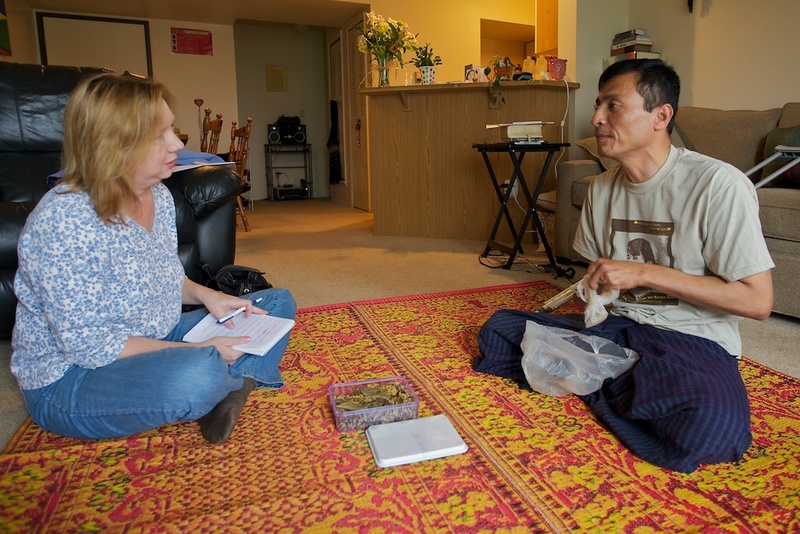 Bonnie Blackburn and Myo Myint. © 2011 John Gevers. Ellie Bogue and Myo Myint. © 2011 John Gevers. 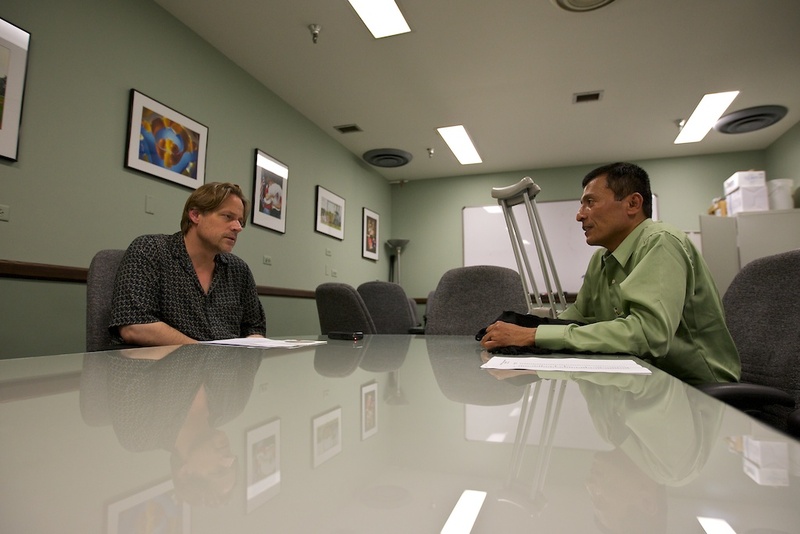 Myo Myint and Phil Shaull. © 2011 John Gevers. Steve Penhollow and Myo Myint. © 2011 John Gevers. Emilie Henry, Myo Myint, and Kim Meiser. © 2011 John Gevers. John Davis and Myo Myint. © 2011 John Gevers. Indiana’s NewsCenter interviewed me about this documentary recently and the two-part, 10 minute interview can be viewed online here and here. The webpages load a bit slowly. My thanks to the TV station’s Emilie Henry, John Hartman, and Al Crain. 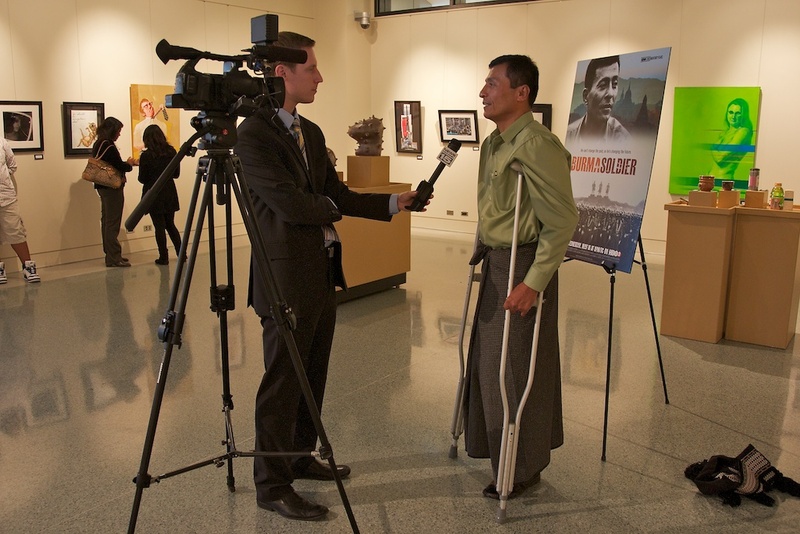 In advance of the release of the documentary film, “Burmese Soldier,” the BBC recorded a 10-minute interview with remarkable Myo Myint who now lives in Fort Wayne, Indiana. 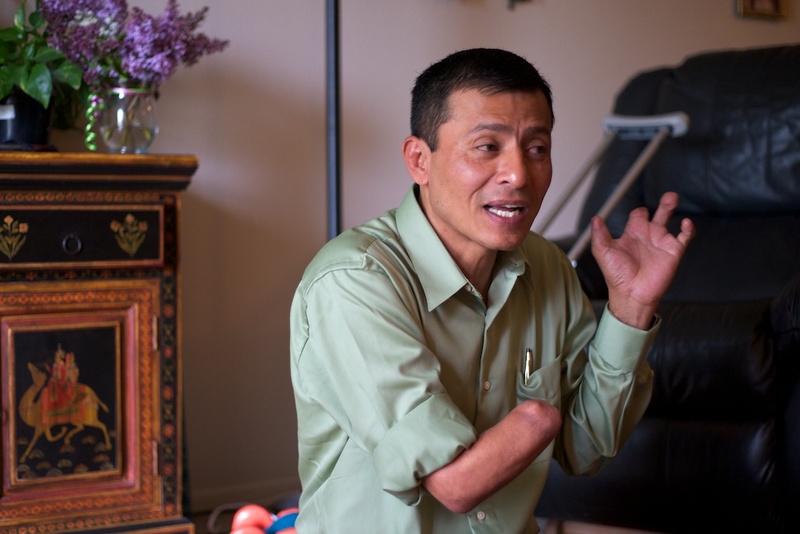 The former Burmese soldier was badly injured by a landmine, left the army and joined the pro-democracy movement. 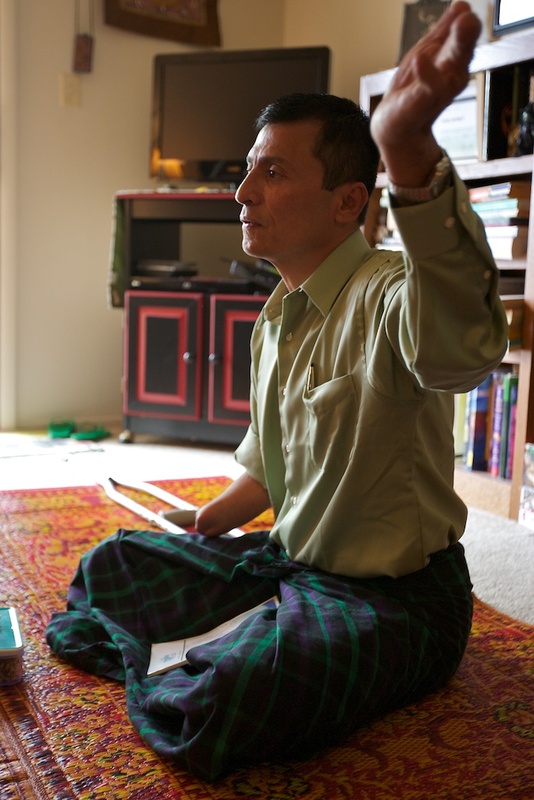 Myo Myint was then put in prison and ended up spending over fourteen years there before fleeing to Thailand and then the United States. 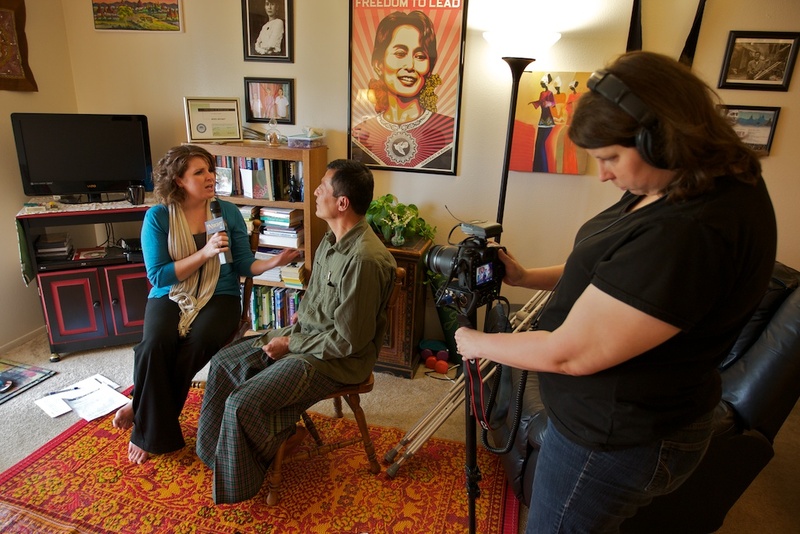 For those of you in the Fort Wayne area, the movie about Myo Myint’s life will be shown during a special screening for our community at a date soon to be announced. Please check back here for details as they become known. “Burma Soldier,” narrated by Colin Farrell with music by U2, is a co-production of LeBrocquy Fraser Productions in Dublin and Break Thru Films in New York. Chin people of Burma, many of whom are refugees, gathered on February 19, 2011, in their new home, Fort Wayne, Indiana, to celebrate Chin National Day. This video, featuring young people dancing traditional Chin dance, is part of John Gevers’ “Yearning to Breathe Free” documentary exhibition currently in production. © John Gevers, NEW MEDIA BREW, Inc. All rights reserved. Burma breakdances from John Gevers on Vimeo. The new generation of Burmese young men now living in Fort Wayne, Indiana, strut their breakdancing selves at Burma Night, 3.6.2011. This is part of John Gevers’ documentary exhibition, “Yearning to Breathe Free,” which tells the stories of refugees from other lands who now live in the Heartland of the United States. This segment shows how rapid assimilation into a new culture can occur, especially among those from the younger generation. It is not uncommon for teenagers from Burma to report that they spent their entire lives prior to being granted admittance to the U.S. in a refugee camp on the Thai-Burma border. 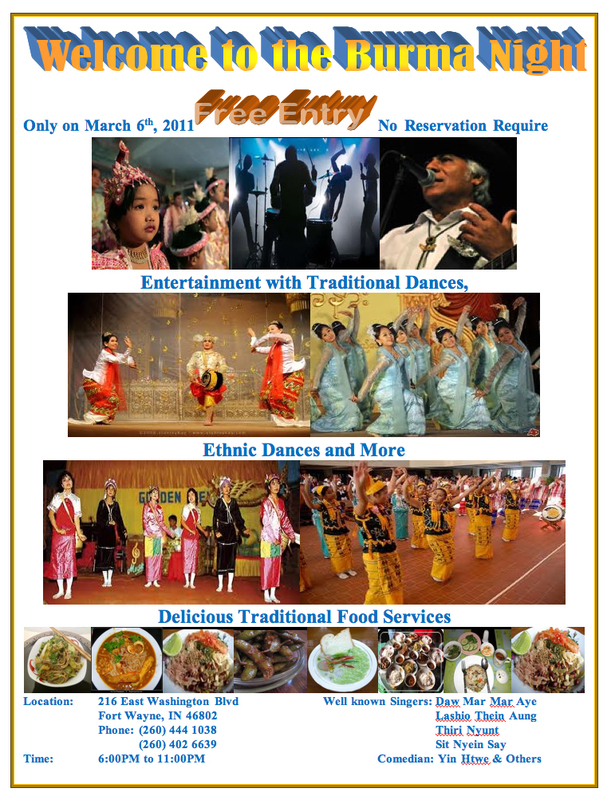 Join the fun on March 6th 6-11 pm, 216 E. Washington Blvd. You are currently browsing the archives for the fort wayne indiana category.